The last time you wore a t-shirt? Here’s a fun game we can all play (If you like games like I do). Tell me about the last time you wore a t-shirt. Or any time you wore a t-shirt that you remember well. Make it fun, tell a little story. No pressure. Seriously. It doesn’t have to be a novella or anything. I (and I think other people) just want to read a short yarn. It could be funny, weird, emotional, angry, philosophical, whatever. It’s probably best to just let it spill out of your keyboard without thinking too much. I have two full drawers of t-shirts. What can I say, I’m a t-shirt person. After showering off the working-til-3:00 AM grunge, I confronted my selection of t-shirts and asked who was willing to cover my upper torso. Every shirt raised its hand. I picked the faded, thinning, stainy-armpit blue one. There’s a reason it’s fairly beat up and sad – it’s my favorite. I put it on and immediately thought of Jenni, who would want to rip it up and turn it into a laundry room rug. 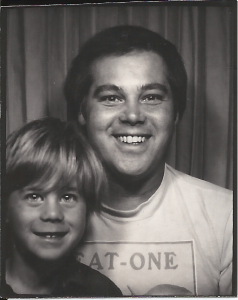 I also thought of my dad, who gave me his old, wearing-thin “Eat One” Florida Orange shirt, long ago when it hung over my skinny frame like a set of drapes. Whatever happened to that shirt? See? That’s it. A little stream-of-consciousness, a little weirdness. A sort of gazpacho of tales. Your turn. Tell your story in the comments below. And send a friend here so they can share in the weirdness! 4 Responses to The last time you wore a t-shirt? I peered down, but there was no need. The screen printing on the front of the shirt said “The Green Man Group,” a supposedly humorous nod to our athletes and school color. “It doesn’t.” I replied, stooping to lift a basket of laundry. Wait – was there writing on the back of my shirt? I’d forgotten. I closed my eyes and tried to picture the back of the shirt. “Coca-Cola” scrolled in white across the green fabric appeared in my mind’s eye. “Oh, sorry, you’re right,” I said, feeling very stupid. Thoughts of ethics, cradle-to-grave advertising, corporate greed, and soda machines in middle schools swirled through my head. I have so much to teach my daughters, to protect them. But Ariel was already focused on her journaling yet again, so I would save this lesson for another day. A few nights ago my youngest daughter got sick and threw up in my face. Literally in my face, and all over me. It was a split second decision by me to face her in towards me to try to contain it, or point her outwards. I maintain the belief that it was just water. After we showered i needed to find another set of pajamas for myself. I picked a very ratty shirt I had received from a mud run I did two years ago. The kind of mud run where you feel pretty badass (and very muddy) afterwards. The free shirt that year was sponsored by a *name brand* t-shirt company, the kind where you pay extra for everyone to see their fancy name and design on it. As such, it was a thin shirt, with rips in the hems, because, you know, that’s *fancy*. The next morning was normally a gym day. However, being still sick, I couldn’t take my daughter with me. So it was a workout at home in my pajamas day. The armpits of the shirt were badly ripped, and I looked pretty dumb doing my military presses with my armpits all showing. So, I ripped the sleeves off. Oh yea, now I really felt badass. I think I have a new workout shirt. That *is* truly badass, Jessica. Thanks for sharing your badassness! Thank you, Jenni! Great story. We could probably spend a lot of time talking about ethics and cradle-to-grave advertising. It fascinates me.